From at least the time of John Calvin, the Reformed churches have interpreted 1 Corinthians 11:29 as requiring a profession of faith prior to participation in the Lord's Supper. Taking the phrase "discerning the Lord's body" in the sense of implying profession is but a particular instance of the general Reformed rule: confession of faith is prior to the Lord's Table. In the nature of the case, profession of the covenant with the mouth comes before feeding upon the symbols of the covenant with the mouth. Our confessional standards understand 1 Corinthians 11:17–34 as providing warnings to all Christians. But some say that the warnings apply only to those who have sinned as the Corinthians did. Most of these desire to admit children to the Lord's Supper who are unable to do what the warnings require. This article defends the historic way of understanding the warning statements. 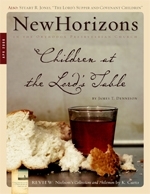 A recent decision of the Christian Reformed Church (June 2006) to prepare the way for child communion within that denomination highlights the durability of that issue. The General Assembly of the Orthodox Presbyterian Church received a report on this issue in 1987 in which a division of opinion was expressed. I will argue that the confessional standards of the OPC are correct in disallowing the practice of paedocommunion, because of the nature of the Lord's Supper as a covenant renewal meal. When water and other drinks are so readily available in the United States, it is not easy to be gripped by the words of Jesus, "I thirst" (John 19:28). Christ was made like his brothers in every respect (Heb. 2:17), and his thirst while hanging on the cross was certainly real. The preaching of the Word of God is nothing less than Christ's message given to a particular congregation at a particular time and in particular circumstances. Through preaching done by a man who has been commissioned by the Lord of the church, Jesus Christ draws his sheep to his fold and feeds them heavenly food (cf. John 6:31–33, 50, 51).